Overnight and first thing this morning there was a series of very loud bangs (bear bangers local call them) and lots of noise from megaphones, this was being done to move bears away from the campgrounds, a reassuring thing. After yesterdays dire warnings about every campsite in the whole of the northern hemisphere being full due to the Canadian public holiday, we got up early and we were away by 8.00 hoping to get to the campground before they were full. We got up a little earlier (coldest night yet 4.4 degrees) managing to leave by 8.40, having an overly sweet instant porridge and a poo in a hole (not at the same time though). Then it was straight back on the Smith-Dorrian road, it was considerably quieter than out last sojourn along it. Surprisingly the surface was a little better so the riding easier and we made better time. One instant porridge breakfast and a swift packing of bags and we were ready for the off. 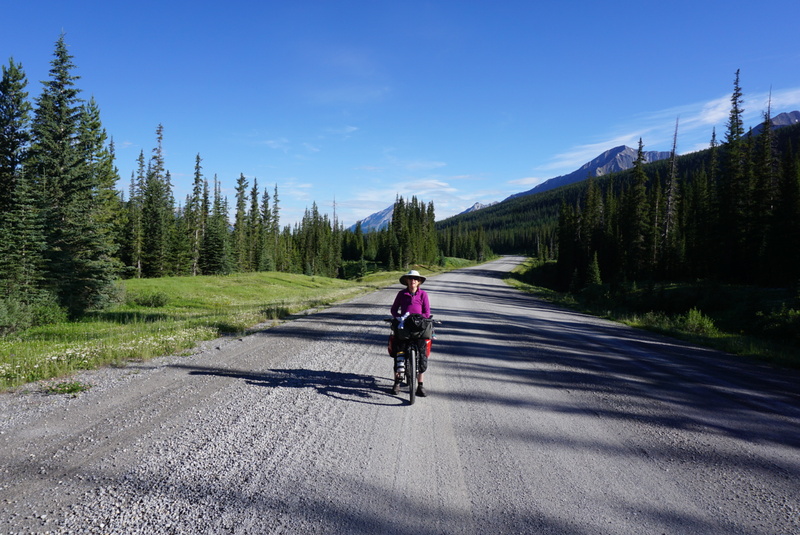 We said farewell to the Spray Lakes campground and set off in very pleasant morning sunshine. A brief stop at a small stream to filter water for today’s journey. Our first ride out, starting in Banff finishing 20 miles later at Spray Valley Campground plot number 9. 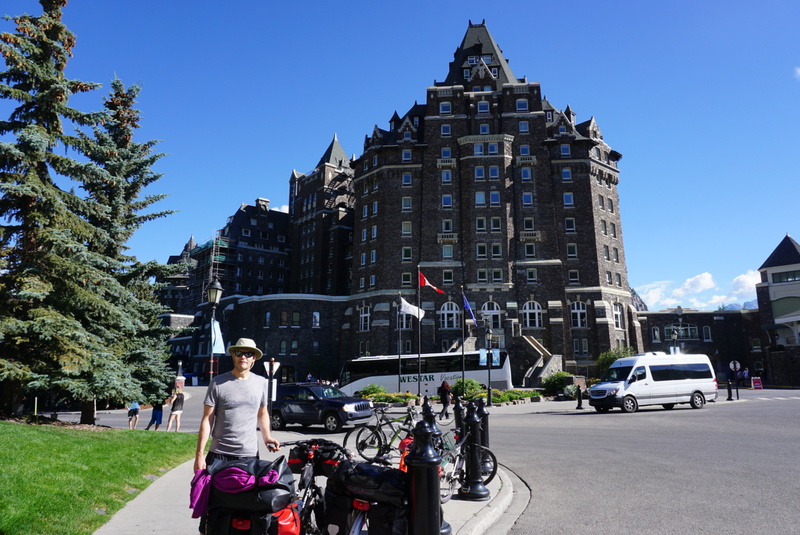 We started the day well as quick visit to the post office then on to the Banff Springs Hotel and the official start of our journey. Having exhausted all possible delaying opportunities it was now bike assembly time. Our flight was at 1:15 Sunday 24th July from Gatwick airport, we booked into the Premier Inn North (next to the terminal) the night before, which did give a stress free journey thanks Emily for a smooth ride, Laura for the musical entertainment and mom for being there. We had a nice evening meal (plenty of wine) and a very leisurely all you can eat breakfast to set us up for the journey. 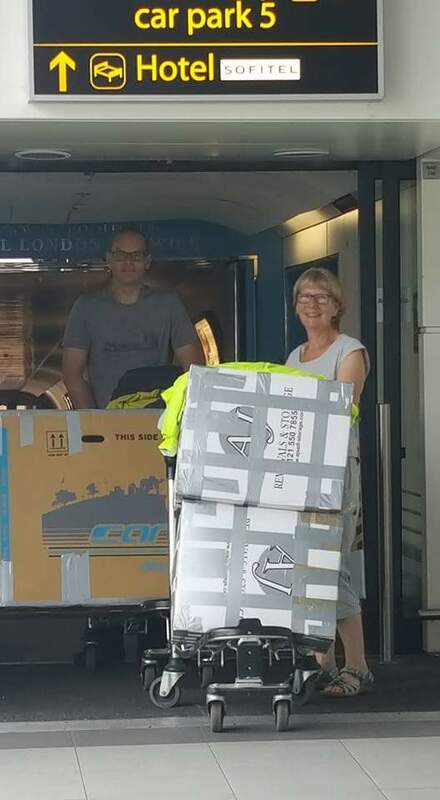 Booking in was easy all our luggage and bikes went into the oversize check in, (Martin was allowed in despite all the end of term cakes). Time has flown by since we decided to cycle the great divide and now my last day at work has come and gone. I started the day with mixed feelings, a sadness that an important part of my life has now been put on hold and excitement about what is to come. 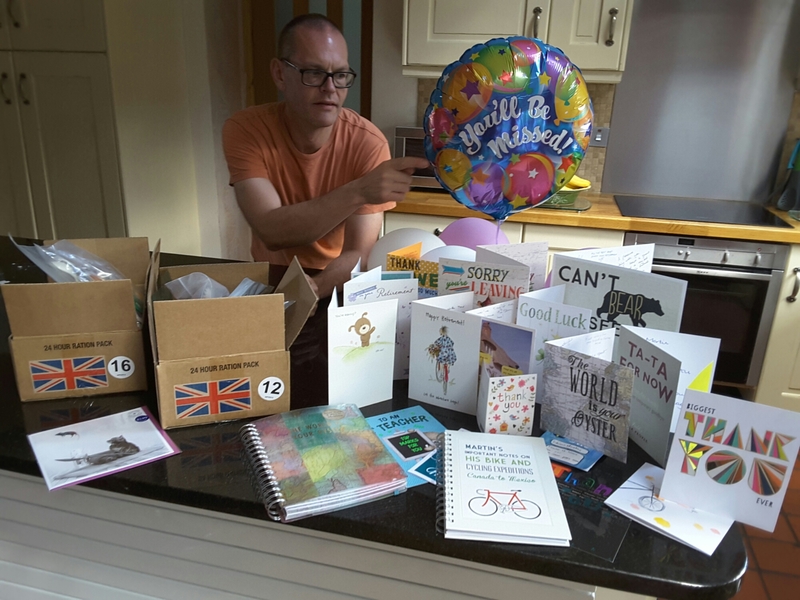 Many thanks for all of the best wishes I have received along with the many gifts and cards. In particular I have to mention my fantastic Year 11’s who are the best and sorry I will miss you enter our 6th form. My last day at Alps after 21 years, sharing the good and difficult with you all. Thank you for a day filled with warm wishes and love, I came away with a feeling of being valued which I will carry with me. A big thank you for the dollars which I will spend wisely treating Martin and I along the way to a slap up meal. I will finish with a quote from Diane’s card which amused us both. It is now only 7 days until we get on the Boeing 737-300 and fly a great circle of 7077 km out to Calgary. 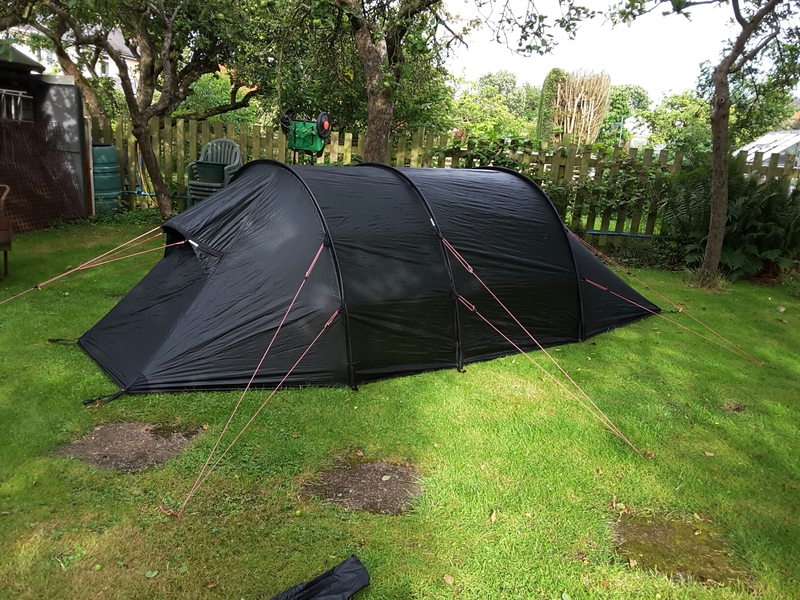 At last the footprint arrived for our new Nammatj 3 GT so out into the garden for a test. We already use an Anjan 3 and love it, but wanted something for some harsh weather and more space, the Nammatj does exactly this.